Let the registration rush begin! Online registration  will open promptly at 9am and previously mailed registrations will be processed at this time. Some classes fill quickly so we recommend reviewing the schedule  and planning your courses in advance. If you need to join OLLI or pay spring membership fees, you can do that ahead of time, too. 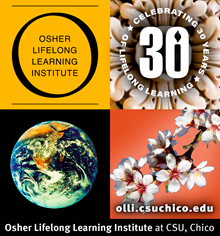 For more information and to view the class schedule, please visit the OLLI website .